NOOKS AND CORNERS OF OLD ENGLAND. THE granite rocks of Cornwall, it is well known, present, in different places, an appearance so singular, that they have been mistaken for the efforts of human art in its earliest and rudest stage. It is, however, questionable whether the group above represented (from a recent Sketch by John Moore West) be one of these very interesting natural curiosities. It is situated about one mile from St. Cleer Church Town, on the road to the Caradoc Mines, on a barrow in a field of the tenement called Trethevey. The pile is of granite, and consists of six upright stones; and covering them, is one large slab in an inclined position. This impost measures 16 feet in length, and 10 feet in breadth, and averages 14 inches in thickness. This upper or covering stone has in it a hole, which is believed to have been used for a flag-pole, or a chain to drag the stone by; but these are merely conjectures. The several stones of which this pile consists are thought to have been brought some miles from whence they now stand, as there are none of the same kind found near the spot. 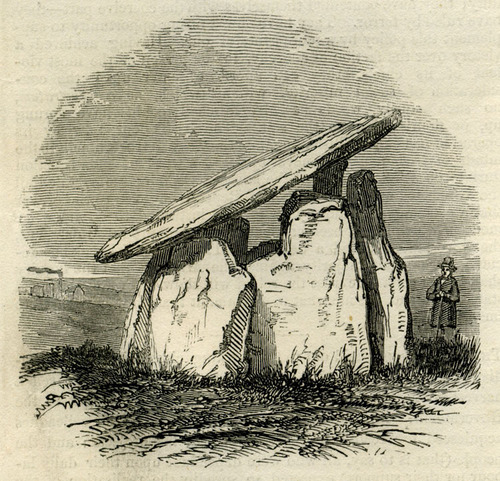 Our Correspondent states that no tradition exists as to the time of the setting up of the Trethevey Stone, but he considers its name determines it to be a work of the ancient Britons, and its object sepulchral; the term Trevedi (Trevethi) signifying, in the British language, the place of the graves. The common belief of the superstitious in the neighbourhood is, that the stone was set up by a giant, and the hole in the covering stone was made by the giant's thumb in lifting it to its present position! Extracted from the Illustrated London News, Vol XII No. 319, 3rd June 1848.